Common Reasons for Florida Truck Accidents | DeLoach, Hofstra & Cavonis, P.A. Whether you’re driving on city streets or zipping down the highway, big rigs are a constant sight on Florida roads. A collision with a tractor-trailer can cause lifelong injury, paralysis, or even early death for occupants of a smaller car, and drivers are wise to give truckers a wide berth. While there have been many safety advances to reduce crash risks, truck accidents remain an unfortunately common occurrence. So why do these accidents keep happening? Every driver knows the perils of traveling near an 18-wheeler, garbage truck, or delivery vehicle. Large vehicles moving at high speeds have many times the impact force of smaller cars; while the long trailers have multiple blind spots where vehicles can be sideswiped or pinned against guardrails. Distracted driving. Truckers spend most of their lives on the road. In order to keep to their deadlines, many are forced to eat, drink, and perform other tasks while driving if they want to stay on schedule. Unfortunately, multitasking diverts the driver’s attention from his surroundings, placing others at risk. Some of the biggest distractions include talking on a cellphone, texting, checking social media, or even watching videos. Accidents caused by these factors continue to be a problem, even through most distracting activities are illegal under federal trucking regulations. Poor truck maintenance. Trucking companies are responsible for sending their drivers out with fully-functioning rigs, and drivers are required by law to make safety inspections on their vehicles before each journey. In spite of these regulations, many trucks on U.S. roadways have bald tires, poor electrical systems, and inadequate brakes, in addition to other components that can suffer sudden failure. Impaired drivers. Many truck drivers use stimulants to stay awake, and may also rely on prescription painkillers and other medications to continue to earn a living. Some truckers may even drink while driving to combat boredom or pain, placing others at risk. Overloaded trailers. Although there are strict regulations on how much cargo a truck can carry, some companies purposely overload vehicles in order to make fewer trips. Overloading greatly affects the balance of a vehicle, compromising a driver’s ability to turn or stop suddenly. Drowsy driving. Long hours behind the wheel can easily make a driver tired, slowing his reflexes and lengthening response time. Truckers were so likely to fall asleep at the wheel that federal laws were enacted to ensure truck drivers take regular rest breaks. Although truckers are forbidden to skip their mandatory driving breaks, many will drive through their rest periods or cut their sleep time short in order to make faster deliveries. Drivers are often paid premiums to make their deliveries quickly, and choosing profit over safety puts both the trucker and other drivers at risk. Reckless driving. Truckers who adhere to strict rest break requirements may feel they have no other choice but to make up time in other ways, such as running red lights or speeding. Truck drivers who are under pressure to make deliveries as fast as possible may become stressed or angry at the drivers around them, prompting reckless driving maneuvers such as tailgating, changing lanes without signaling, and failing to yield to cars that are merging on and off of highways. Many truck accidents are a direct result of negligence on behalf of the truck driver or the trucking company. 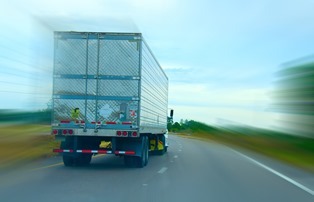 If you've been injured in a truck accident, you should get help as quickly as possible. The trucking company will move fast to collect evidence and minimize its losses, and you need someone working to protect your interests as well. Our attorneys can help you build a strong injury case and advise you of all of your legal options. Simply fill out the form on this page today to make an appointment in our offices.